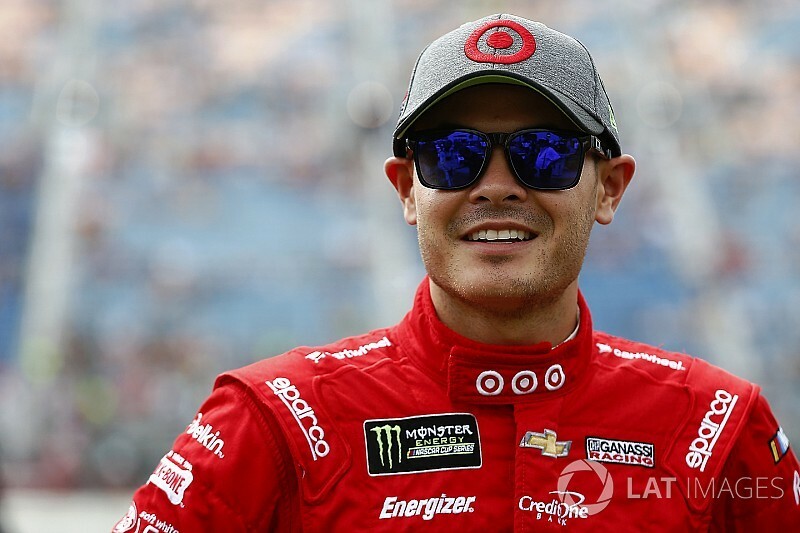 Kyle Larson led first practice at New Hampshire Motor Speedway on Friday. Larson, who finished a career-high second-place in July at the Magic Mile, topped the speed chart with a lap f 135.714mph. Kyle Busch was second quick followed by Kasey Kahne, Martin Truex Jr., Ryan Blaney, Denny Hamlin, Matt Kenseth, Erik Jones, Jamie McMurray and Kurt Busch. Six drivers posted times in the Best 10 Consecutive Lap category. Chase Elliott was fastest (130.558mph) followed by Blaney (130.176mph), Jones (129.299mph), Landon Cassill (128.512mph), Michael McDowell (127.683mph) and Danica Patrick (127.504mph). Chris Buescher's 39 laps were the most completed during the first session. His best lap 21st-fastest -- 133.235mph. McDowell, who is being displaced from the No. 95 Chevy next season, was the first driver on the track for practice. He posted a speed of 128.104mph. The No. 37 Chevy of Chris Buescher (128.754mph) was second on the track followed by David Ragan (128.593mph). After the first five minutes, Trevor Bayne (127.743mph) made his first run followed by Kasey Kahne (131.080mph), who shot up to the top of the board. Erik Jones moved from sixth to third-quick with a lap of 129.542mph then surpassed McDowell with his fourth lap of 129.803mph. Just after the 10-minute mark, Kevin Harvick vaulted to second (130.416mph) but was topped by Chase Elliott (130.617) moments later. Harvick passed Elliott with his fourth lap (130.995mph), then captured P1 with a speed of 131.410mph. “That’s going to be fine,” Harvick said after completing six laps. Kurt Busch bumped Harvick with his sixth lap (131.420mph). Ryan Blaney (131.338mph), Elliott, Kahne, Bowyer (130.496mph), Logano (130.465mph), AJ Allmendinger (130.385mph), Paul Menard (130.144mph) and Jamie McMurray (129.944mph) completed the top 10 speeds in the first 15 minutes. Twenty-five drivers had posted at least one lap. Before the first 20-minutes, Daniel Suarez jumped to the top of the speed chart with a lap of 131.765mph. Kyle Larson (131.665mph) and Matt Kenseth made initial runs with the No. 20 Toyota topping his JGR teammate with a speed of 132.646mph. Just after 20-minutes in, Johnson ran his first lap and jumped to second-quick with a lap of 131.998mph. But before completed his next lap, Johnson lost the back end of the No. 48 Chevy coming into Turns 3 and 4 and hit the wall to bring out the caution. The Hendrick Motorsports team unloaded the back up car for the seven-time champion. Practice resumed at the 24-minute mark with Kenseth leading the session followed by Johnson, Suarez, Larson, Kurt Busch, Harvick, Blaney, Elliott, Kahne and Dale Earnhardt Jr. Twenty-five minutes into the session, Kyle Busch bumped Earnhardt for 10th with a lap of 131.053mph. Moments later, Elliott lost control of his car coming into Turn 3 to bring out the next yellow. He was working his 17th lap and had a top speed of 131.320mph. NASCAR continued the session at the 29-minute mark. Elliott is behind the 8 ball already this weekend with the loss of crew chief Alan Gustafson, who was suspended for illegal modifications to the No. 24 Chevy at Chicagoland. Veteran crew chief Kenny Francis has been assigned to the team this weekend. After the first 30 minutes, Larson bumped up to second (132.448mph) followed by Johnson, Blaney, Suarez, Ryan Newman (131.492mph), Earnhardt (131.478mph), Kurt Busch, Harvick and Elliott. Kahne moved back to fifth with a lap of 131.989mph followed by Bowyer (131.770mph), Suarez (131.765mph), Newman, Earnhardt and Kurt Busch. Forty-minutes into the session, Truex topped the chart with a lap of 134.677mph on his mock qualifying run. It was his second trip and his fourth lap on the track. Over the next 10 minutes, Kyle Busch jumped up to second-quick (134.136mph) followed by Kenseth (133.999mph), Denny Hamlin (133.375mph), Newman, Brad Keselowski (132.641mph), Larson, Suarez, Johnson and Blaney. Larson vaulted to second with a mock-qualifying run of 134.311mph. Kahne ran 11th followed by Harvick, Bowyer, Earnhardt, Ragan, Kurt Busch, Elliott, Jamie McMurray, Logano and Landon Cassill. As more drivers attempted mock qualifying runs, McMurray climbed to fourth (134.056mph), then Earnhardt third (134.202mph). Blaney was the first driver to break the 135mph-mark (135.030mph), but seconds later, Kyle Busch bumped the No. 21 Ford with a lap of 135.342mph. After the first hour, it was Kyle Busch, Blaney, Truex (134.677mph), Larson, Kenseth (134.236mph), Earnhardt, Jones, McMurray, Hamlin and Suarez. Newman, Keselowski, Buescher, Kurt Busch, Johnson, Kahne, Harvick, Bowyer, Ragan and Cassill rounded out the top 20. With 15 minutes remaining in the 85-minute session, Larson led the session with a speed of 135.714mph. Kyle Busch (135.342mph) ran second followed by Blaney, Hamlin, Kahne, Truex, Jones, Kenseth, Earnhardt and Suarez. Johnson returned to the track in the backup car with 13 minutes to go in first practice. He was 26th quick in his second lap with a speed of 131.998mph. He completed three laps with a top speed of 133.021mph — 18th-quick at the time. Kahne (134.820mph), who comes to the track with new crew chief Darian Grubb this weekend, climbed up to fifth with 10 minutes remaining. He gained speed on his next run and moved up to third (135.198mph) behind Larson and Kyle Busch. Blaney fell to fourth followed by Hamlin, Truex, Jones, Kenseth, Earnhardt and Suarez. Truex improved to fourth in the closing minutes (135.188mph). Kurt Busch posted the ninth-fastest lap (134.240mph) but was bumped by McMurray (134.340mph). NASCAR Mailbag: Where will Michael McDowell go?